I'm a sucker for good ol' fashioned classic kids' Halloween costumes. There are so many options available these days in comparison to when I was growing up, especially character-themed ones - and that's great, because it makes things a lot easier for parents. But I am just so drawn to simple, classic costumes. Maybe that's because my mom made most of ours, so I feel nostalgic about more traditional costumes with homemade vibes. And I have such wonderful, vivid memories of dressing up as a very handmade Little Bo Peep, and of my baby sister pretending to fly around the room as a truly adorable toddler bat. There's just something I find so endearing about those kinds of costumes. 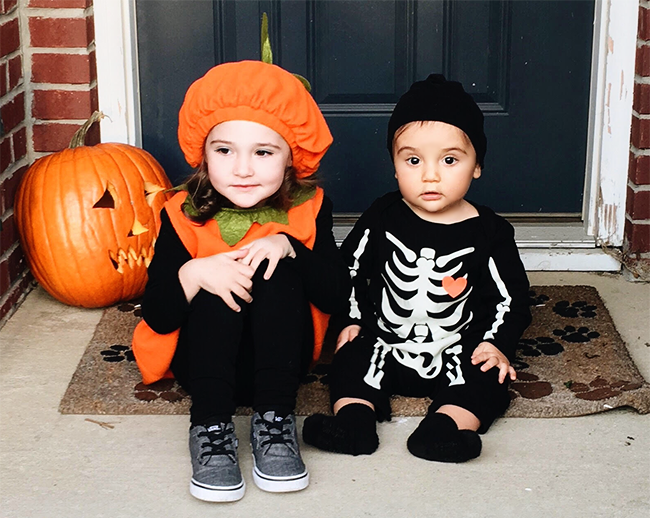 Last year, Essley asked repeatedly to be a pumpkin (as seen in the photos above). 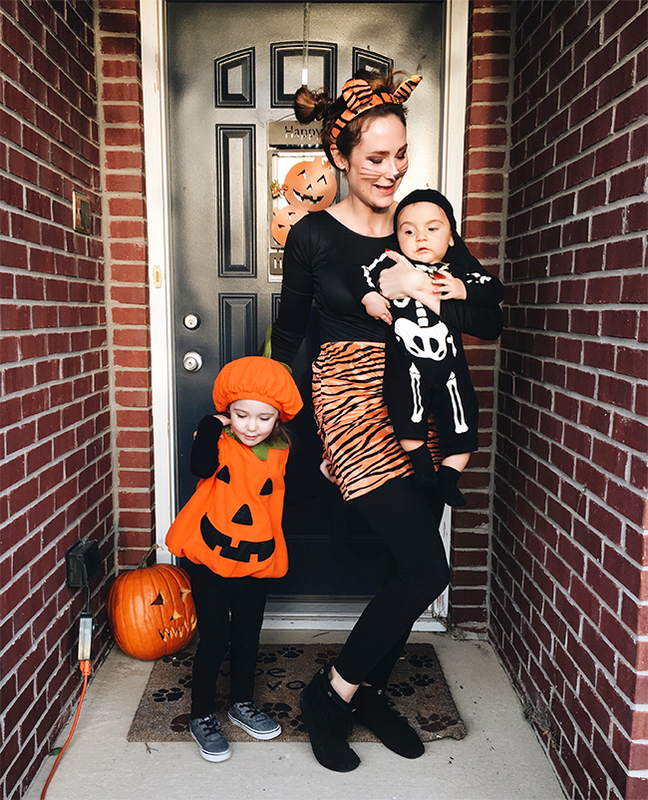 I found her this pumpkin costume for $29 and absolutely adored it - it's so well made and I think Emmett will be able to wear it next year if he wants to be a pumpkin. I found a comfy pair of simple skeleton jammies (here's a similar set for $14) and a little black beanie for Emmett to wear. I thought they looked so sweet together in their no fuss, classic costumes. This year, Essley wants to be a mermaid, and I think we're going to do a cute, no frills dinosaur for Emmett. 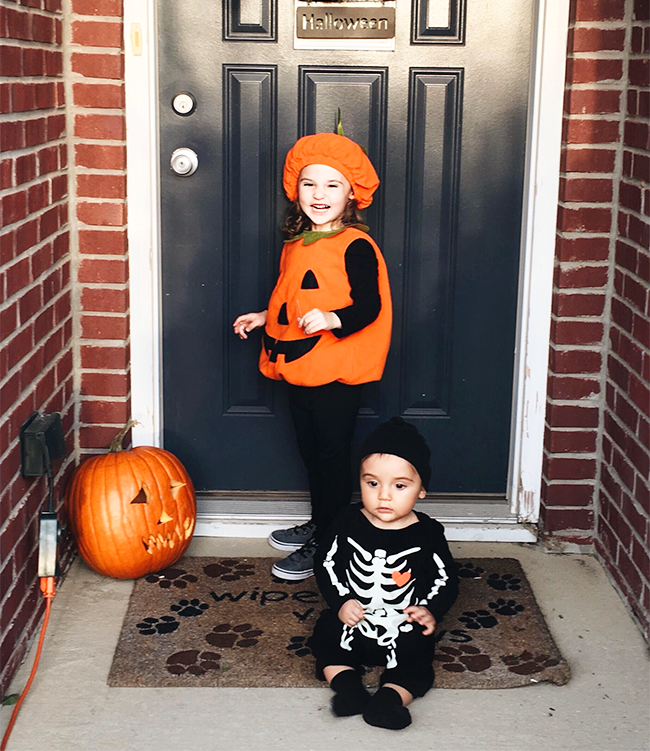 I'm fully aware of the fact that sooner than later, my kids are going to want to pick out costumes that will likely be store bought and character-themed. (This could possibly even occur this year; if the dinosaur doesn't work out, we're going for Emmett's second favorite thing: Elmo.) And that's wonderful! But for now, I'm going to continue swooning over the more classic varieties. If you're on the same page as I am, here is a list of ideas for simple, traditional costumes. If you have kids, what are they wearing this year? Do you have a costume picked out for yourself yet? Your little guys are adorable! We had one of those pumpkin ones for the girls when they were little - so cute! now that mine are teenagers they get out the face paint and do the scary ones - yikes!